Clean out your closets and garage! 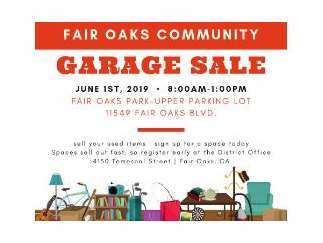 Sell your used items at the Fair Oaks Community Garage Sale. Looking for treasure? Shop nearly sixty sellers for some great deals. $35 per space for sellers. Garage sale spaces are approximately 15' x 14' (two parking spaces). Spaces may be purchased by visiting the Fair Oaks Recreation and Park District office, Monday - Friday between 8:00AM - 5:00PM. No craft vendors allowed. We cannot guarantee the pickup of remaining items by an outside organization. All items must be removed from each space by 2:00pm.